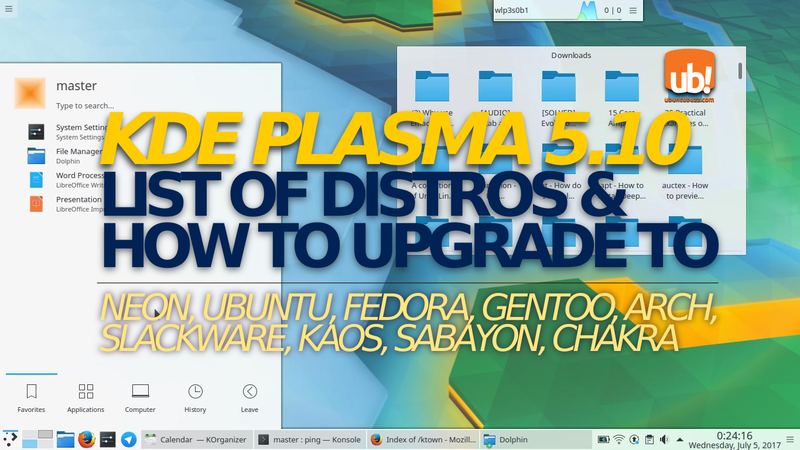 This is a list of GNU/Linux distros which bring latest Plasma 5.10 and info about how to upgrade to 5.10. This includes Neon OS, Slackware, Ubuntu (and derivatives), openSUSE, Gentoo, Sabayon, Chakra, Fedora, and KaOS. 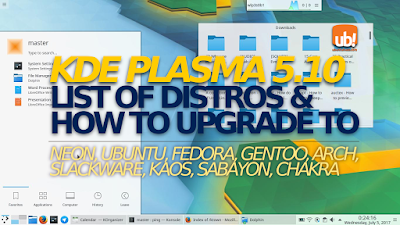 So if you want latest Plasma 5.10.3 (and later), here, you know what distro to download or the way to upgrade to that version. Happy testing Plasma! The easy way is to use Slackware Live by Eric Hameleers with Plasma 5.10.2 http://alien.slackbook.org/blog/new-iso-for-slackware-live-plasma5-with-stack-clash-proof-kernel-and-plasma-5-10-2/. If you want the repo, see Eric Hameleers' repo of KDE Plasma 5.10.2 here http://bear.alienbase.nl/mirrors/alien-kde/current/latest/ and use slackpkg+. Read the README here. Or you can have Plasma 5.10.3 by using Ubuntu 17.10 Artful Aardvark daily image. Remember that this article is written on 05 July 2017, so the download page may change later. The latest Tumbleweed always has the latest Plasma and if you need, use this OneClickInstall https://software.opensuse.org/package/plasma5-desktop. Read more about Plasma here and upgrading to Plasma 5 here. Read more about Sabayon packages here and more about its package management here. https://copr.fedorainfracloud.org/coprs/mkyral/plasma-unstable/ for Fedora 25, 26, and Rawhide. However, instead of using COPR, you can use Fedora Rawhide that has Plasma 5.10.3 already. 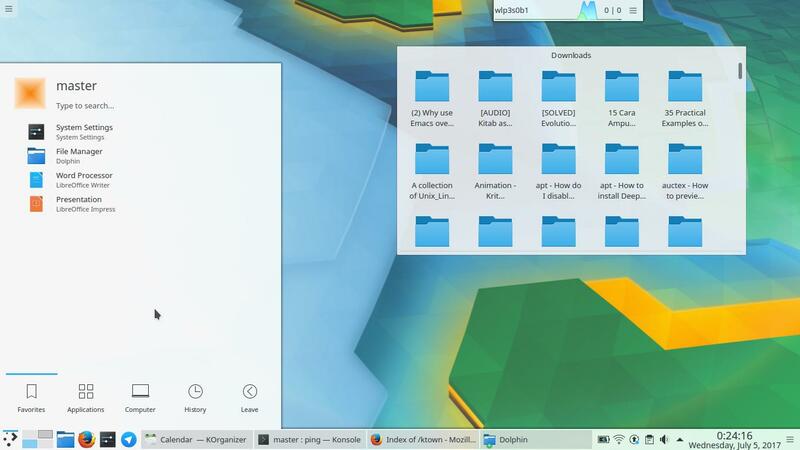 Plasma is the desktop environment from The KDE Project which is well-known for its beauty and power, the highly-customizable and complete desktop solution in user-friendly appearance. Plasma Desktop makes any GNU/Linux operating system looks very cool and easy to use, to serve all computer users' needs. Plasma is the default desktop for popular GNU/Linux OSes like Kubuntu, openSUSE, Chakra, KaOS, and so on. The KDE website is located at http://kde.org and its Plasma page is https://www.kde.org/plasma-desktop.